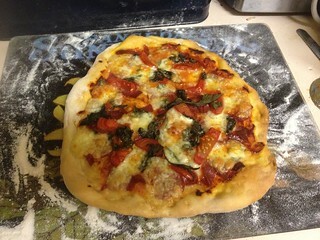 One of my favourite things to cook in recent times has been homemade pizza. I won’t let myself have it more than once every couple of weeks, but I like it so much I never order takeaway pizza now (unless we’re out — ie: nowhere near home!) I do the whole things from scratch, dough, all the toppings. It’s easier than you’d think. The dough recipe is a simple 250g pizza flour, 1/2 teaspoon dried yeast, 1/2 teaspoon salt, 1 tablespoon olive oil and 175ml of water. Mix it up, kneed it, leave it for a while. This is enough for two pretty full size pizzas. Split the dough, flatten it out, add a tomato base then whatever topping you like. For us it’s usually salami or ham, plus mushroom, tomato, or whatever else we have on hand. Cheese can be mozzarella but is usually boccocini balls — a nicer soft cheese that melts really well. We tend to vary the toppings, but you could have anything you wanted, within reason of course.